Audi has quietly introduced an updated A1 e-tron. It features a more powerful electric motor that develops 115 HP (85 kW) and 300 Nm (221 lb-ft) of torque. Audi has quietly introduced an updated A1 e-tron. Described as a "next-generation" model, the new A1 e-tron has a more powerful electric motor that develops 115 HP (85 kW) and 300 Nm (221 lb-ft) of torque - an increase of 13 HP (10 kW) and 60 Nm (44 lb-ft). It enables the model to accelerate from 0-100 km/h in 9.8 seconds and hit an electronically-limited top speed of 130 km/h (81 mph). The electric motor is powered by a 13.3 kWh lithium-ion battery which enables the car to travel approximately 50 km (31 miles) on electricity alone. When the battery is low, a 34 HP (25 kW) rotary engine-generator is activated to recharge the battery and enable the model to have an overall range of roughly 250 km (155 miles). The new A1 e-tron has also been equipped with an improved electronic stability control system and an optimized energy recuperation system with five different levels. 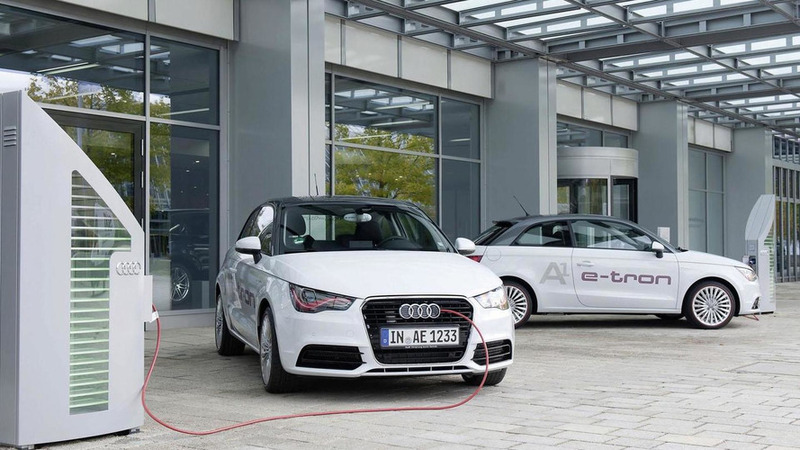 Audi is currently testing the A1 e-tron and will deploy a total of 80 models which are expected to drive one million kilometers (621,371 miles). The testing program also has a number of side projects including an “Intelligent Charging” system which will enable drivers to locate and reserve an intelligent charging station as well as remotely monitor the car's charging status via a smartphone.